Eating out is one of the biggest money wasting opportunities of our time. It’s nothing you’ve never heard before. Most people would be surprised at the amount of money they spent on restaurants, take-out and the like. You’re always going to pay more to eat out than to eat at home, because you’re paying for more than just the food. You’re also paying for the service, the location, the effort to cook, and on top of that, the restaurant needs to make a profit. Eating at home and cooking satisfying meals really isn’t as hard as you think it is. There are so many resources for recipes or cooking tips and tricks available to us these days. Even YouTube-ing a recipe can be the best and cheapest way for visual learners to master a dish. Celebrity chefs are a good starting place to look for recipes and pointers. They serve us up delicious recipes, and tricks of the trade. However, their recipes often they can be filled with expensive ingredients or require an extensive list of components. Luckily, Melissa at Bargaineering has compiled a list of celebrity chefs whose recipes are not only delectable, but are quick, easy, and affordable. 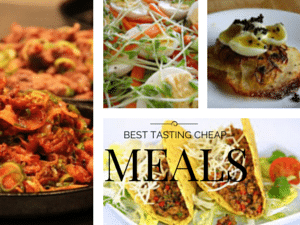 If you want to branch out to trying new dishes, then take a look at 5 Celebrity Chef’s Best Tasting Bargain Food and get inspired.